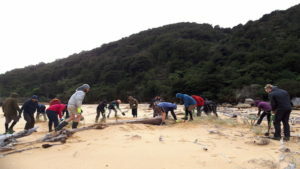 Once upon a time—just 30 years ago—weka were abundant in Abel Tasman National Park and throughout Golden Bay. I remember driving over Takaka Hill and seeing them on the side of the road. Within the park they were abundant at most locations and were a particular feature at Totaranui. Then they disappeared. I don’t think anyone really knows why. My best guess is that it relates to ferrets being released from a fur farm in Golden Bay. If this is the case, the good news is that once the weka had been eaten the ferrets were not able to survive in the absence of rabbits. 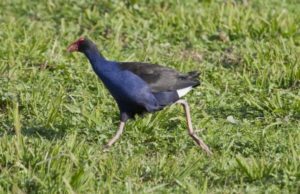 With this theory in mind, DOC re-introduced weka to Totaranui in 2006. 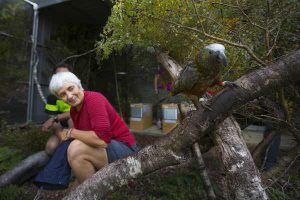 Mike Ogle led this operation, catching birds in the Marlborough Sounds, holding them at Totaranui in specially built aviaries until they were well adjusted to the new site and gradually releasing them. Intensive stoat trapping was aimed at giving them the best chance to thrive. Some of these birds dispersed widely but enough stayed and bred to ensure a stronghold for the species in the park. I hear reports of odd birds elsewhere in the park and cannot be sure whether these are individuals that did a runner from Totaranui or are they survivors from the original population? I am fascinated as to why this Totaranui population is not expanding more rapidly into the adjacent parts of the park. Perhaps this is due to stoat predation (but weka are thriving in the Marlborough Sounds and on the West Coast in the presence of stoats and absence of ferrets). The planned stoat control through much of the park south of Totaranui may provide an opportunity for this range expansion. The presence of weka is often a highlight for people in the park even if the experience involves some uninvited foraging in their tucker box. This inquisitiveness and omnivorous feeding will be a risk to any attempt by Project Janszoon to re-establish breeding colonies of sooty shearwater or fluttering shearwater. 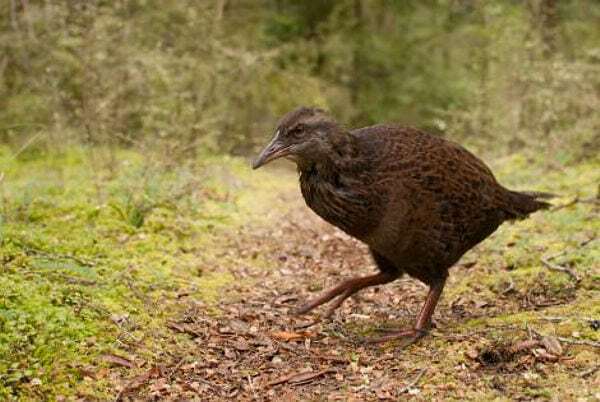 Weka will be quick to take an egg or unguarded nestling. I wonder if anyone has observations on encounters between weka and penguins? It would be an evenly matched tussle I imagine.